When I constructed this website in January 2014 I included a ‘News Page’ as I anticipated a reasonable amount of input from others. ‘Home Page’ as well as at the top of the ‘About Us’ page. Do you have Something Interesting to add to this Page? A weekend in Perth could prove to be a lot of fun! 12 June 2018 - This Forum has been quiet for sometime due to a lack of support from those who ought to take an interest in it! The SACS Summer Philatelic Weekend took place last Saturday and Sunday (9-10 June) at the Strawberry Bank Hotel in Meriden. Due to last minute cancellations and illness the numbers attending were less than normal, but 14 members did make it to enjoy a variety of interesting displays. 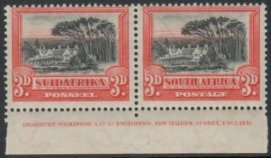 Mike Tonking from South Africa was the only overseas visitor and entertained the audience with his Union of South Africa, King’s Head Roll stamps... it included just about every possible collectable item, with some very rare watermark varieties. Bob Lester presented two displays on Saturday (one being in lieu of Bob Hill’s display - who couldn’t make it due to illness) Bob presented Christmas seals from 1929, including booklets and those on cover. Bob’s second display covered WWI & WWII street flags demonstrating the enormous scope of said subject. Chris Oliver covered Travelling (Mobile) Post Offices from circa mid 1930’s until the end of the service. Many covers, registered items and different cancellations and cachets were shown. Otto Peetoom presented a Power Point display supported by his material covering ‘Birds on Stamps’ by species for Southern Africa, countries including the former Homelands (Transkei, Bophuthatswana, Venda and Ciskei) plus Republic of South Africa (RSA), South West Africa (SWA) and Namibia. Out of 170 bird species on stamps, Southern Africa offers 243 different birds that belong to 66 species. Extinct birds are prefixed by ‘0’. The display included hand painted essays for SWA issues. Bird stamps found in booklets, on FDC and Maxicards were included as well as Birds on Postal Stationery. As usual the Sunday (short) displays include bring what you wish and after lunch the weekend was rounded off with a ‘live’ auction. This part of the website has been quiet recently as I have been scanning and cropping a large number of birds on stamps for a new web page. 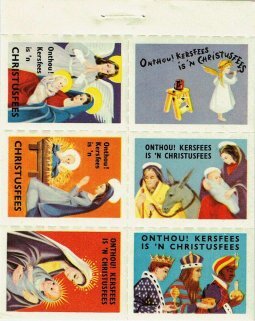 Perhaps Thematics is not everybody’s cup of tea, but I regard it as a ‘fun page’ and it provides an insight to a different angle of philately. certain countries abound with ‘birds on stamps’. Botswana, South African and Namibia all have a high tally of birds...Angola, Lesotho and Mozambique eclipse the foregoing numbers! The above subject reared its head in the March 2012 edition of The Springbok No 317. 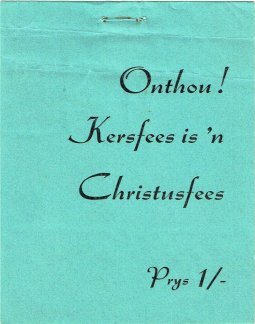 Eddie Bridges illustrated the bilingual covers of a booklet plus two se-tenant panes of six, one in English and the other in Afrikaans. There was an appeal for dated examples on cover. Several years have passed since this subject received an airing. 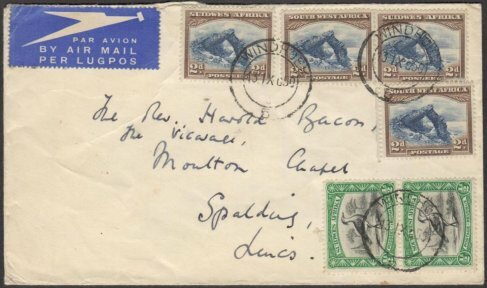 Otto has a cover with one of the above seals (Illustrated below) Posted from Pretoria with a machine cancel 19 XII 1959 which ‘ties’ the label to the envelope. 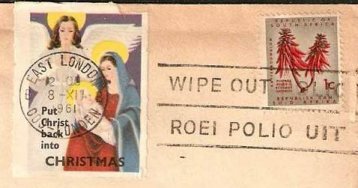 Simon’s two covers prove that these private Christmas seals remained in use for several years. Simon illustrated another pane of six, which includes the label on the 1967 cover, but the captions are in Afrikaans. Another feature worthy of note is that the first batch of private seals are rouletted between the labels and the pane at left is perforated. 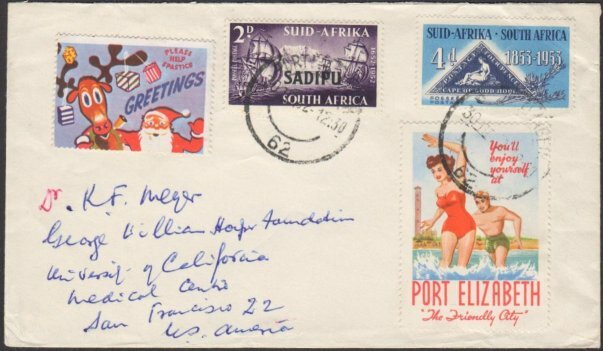 On a cover (illustrated below) posted PORT ELIZABETH 30 IX 62 conveys (Christmas) ‘GREETINGS’ with a caption in the NE corner ‘PLEASE HELP SPASTICS’. Does anyone have the same or similar labels to share with our Forum? During 1988 I acquired a comprehensive Union collection which had been formed in the USA. There were numerous blocks of four that had been carefully wrapped in glassine paper before being hinged onto album pages. Thus all the stamps remained unmounted mint. The collection included the 1927 - 28 pictorials in blocks of four plus the following Imprint blocks of four. It is the only example I have seen of a 5/- in an Imprint block of four. On the 6 of April, 1652, Johan van Riebeeck landed on the shore of Table Bay. 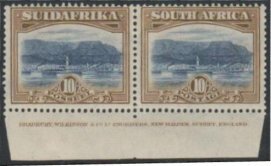 On the 6 April, 1952 a set of five stamps was issued by the Union of South Africa to commemorate the tercentenary (1652-1952) of that landing. 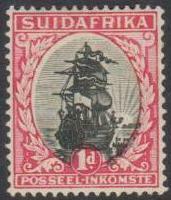 On the 4½d denominated stamp of this issue, the portrait of Johan van Riebeeck is shown. Each denominated bank-note of the current issue of the South African Reserve Bank depicts a similar portrait. Is it a true likeness of Van Riebeeck? ‘The portrait of Jan van Riebeeck that appears on our bank is not, I believe, a true likeness’, said Dr H.B. Thom, editor of the next edition of Van Riebeeck’s Diary, in an interview with a the Cape Times Limited. ‘The wrong portrait was chosen when the bank-notes were printed. It is not accepted by experts and has been removed from the Rijksmuseum at Amsterdam. I am not going to use it in the diary’. ‘Although I have not done first-hand research on the matter myself - I do not believe it would be possible to do it in this country - I accept the conclusions of the Dutch historian, Godee Molsbergen, who has shown that the portrait of Van Riebeeck painted in Batavia about 1667 is probably the best likeness we have’. There were three pictures for which the claim had been advanced that they were portraits of Van Riebeeck, said Dr Thom. The first was the ‘Town House’ portrait, which hangs in the City Hall at Cape Town. The second, the portrait supposed to have been done by the 17th century Dutch artist, Dirk Craey, and which used to hang in the Rijksmuseum at Amsterdam and the third, the ‘Batavia’ portrait. It is a copy of the Craey picture that appears on South African bank-notes and of course on the 4½d V.R. Tercentenary stamp. The history of the three pictures is briefly as follows: The ‘Town House’ picture is supposed to have been painted at the Cape about 1660 by an unknown artist. The first mention of it is in a diary kept by Johan van Riebeeck’s grand-daughter who visited the Cape in 1710. It was then in the possession of a Hollander. Van Riebeeck’s grand-daughter described it as having already gone very dark. In 1804 it was officially ‘discovered’ and presented to the Town. It was generally accepted as a true portrait until 1884, when the publication of the Craey portrait caused it to fall from favour. ‘It may be any other Governor’, said Mr H.V.C. Leibrandt, former Keeper of the Colonial Archives in 1892. Later researches by Sir Percival David have made it seem more probable that it was originally a portrait of Van Riebeeck. But these researches have also shown that the portrait has been modified and ‘improved’. On the ‘Town House’ portrait, Van Riebeeck wears a hat. The Craey portrait is supposed to have been painted in 1650, the year before Van Riebeeck left for the Cape of Good Hope. Godee Molsbergen has said of it: ‘It has been over-painted so heavily that the Director of the Rijksmuseum is not certain if it is an original piece. In its present state it shows few, if any, brush strokes from Craey’s hand. This picture has since been removed from the Rijksmuseum. The Batavia portrait, which has been accepted by Dr Thom as authentic, was the one of a large collection of family portraits that was presented to the Rijksmuseum by a descendant of Van Riebeeck in 1884. The then Director of the Rijksmuseum of Amsterdam said there was ‘not the least reason to doubt its authenticity’. Dr H.B. Thom is the Principal of the Stellenbosch University. The ‘Cape Times’ - Dr Thom interview was supplemented by three illustrations, namely the ‘Batavia’ portrait, the ‘Town House’ portrait, and the ‘Craey’ portrait. The portrait on the 4½d Van Riebeeck stamp resembles the ‘Craey’ portrait published by the ‘Cape Times’ and referred to afore. The portrait on the South African Bank-notes was engraved by Bradbury, Wilkinson and Co., Limited, also resembles the ‘Craey’ portrait, but the hair to the right-hand side of the head differs somewhat to that shown on the ‘Craey’ portrait. ‘A portrait of Jan Van Riebeeck by the Dutch painted Slijper’. Further research in this connection will have to be made. This supplement is in my Africana collection. 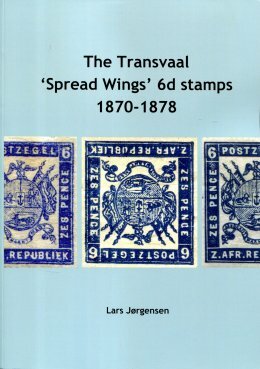 On page 6 in ‘The Hand-struck Letter Stamps of the Cape of Good Hope from 1792 to 1853 and the Postmarks from 1853 to 1910’ by A.A. Jurgens, a portrait is shown and captioned ‘Johan van Riebeeck, 1st Commander, 1652 - 1662. Photo: Elliott Collection’. This same portrait is also shown in a handbook published by the well-known Cape Town firm J.C. Juta and Company in 1910 and entitled ‘Souvenir of the Historical Pageant of South Africa’. 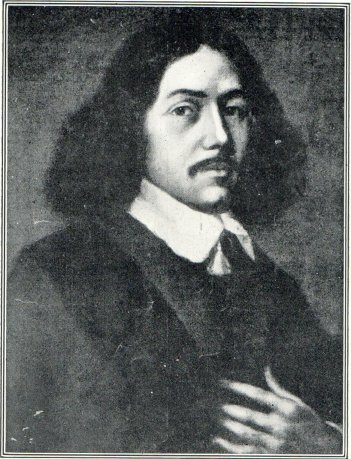 This latter portrait is captioned ‘Jan Anthoniezoon Van Riebeeck Copied from the original at Amsterdam Copyright Photo-Elliott. 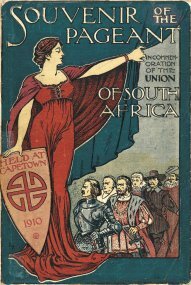 Van Riebeeck portrait included in the 1910 Pageant Booklet, front cover illustration at the top of this page. The name of its painter is not mentioned. It is in the Arthur Elliott Collection of historical photographs anent the Cape of Good Hope. This collection was acquired by the Union Government of South Africa. This handbook is in my collection. This portrait differs from the ‘Craey’ portrait published by the ‘Cape Times’ as mentioned afore. Here again further research will have to be made. 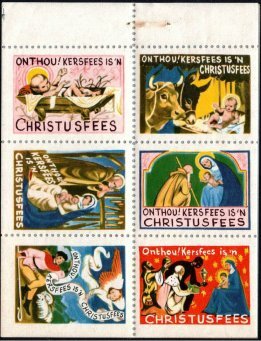 In 1952, the Netherlands also issued a ‘Jan Van Riebeeck Tercentenary’ set of four stamps. 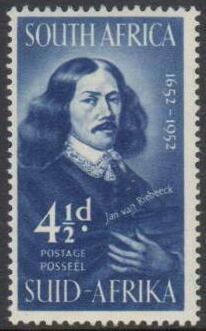 Each stamp depicted a portrait of Van Riebeeck. Was this portrait adapted from an original painting and by whom? If, as Dr Thom states, the portrait shown on the Bank-notes, and on the Van Riebeeck 4½d stamp is not a true likeness of the first Commander at the Cape, then it is entitled to be called as William Shakespeare calls it i.e. the V.R. 4½d, ‘the stamp of one defect’ - Hamlet - Act I, Scene IV. First issued in January 1926 and remained in use until it was finally replaced during 1954 by the 1d Black Wildebeest. The design of this ancient sailing vessel is said to be the Dromedaris, being Van Riebeeck’s ship on which he arrived at the Cape in 1652. I recently found a report that disagrees with the foregoing. Mr C. Gonin has sent us a newspaper cutting, which states that the model used for the design of the current 1d stamp, was a 24-gun Dutch man-of-war of a much later period than Van Riebeeck’s ship, ‘Dromedaris’, which it is meant to represent. The model ship was found in a Dutch church and sent to President Kruger, who forwarded it to the Transvaal Museum for safe keeping, whence it went to the New Museum, Pretoria. 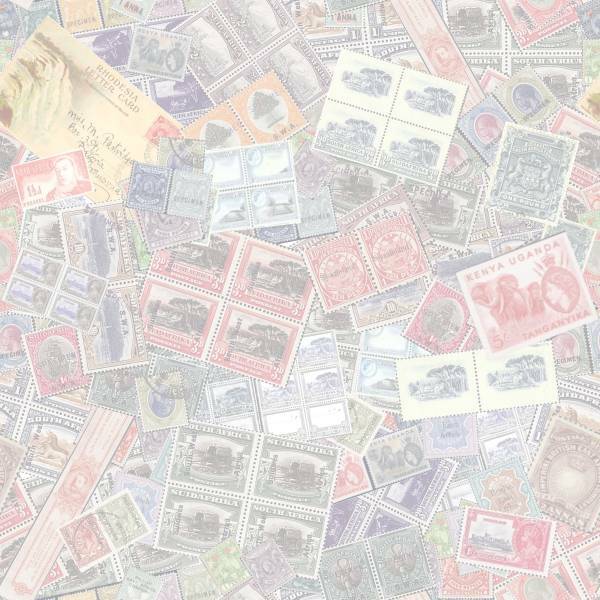 Anyone would intimates that they are a collector of Thematics immediately brings to mind someone who accumulates stamps with pretty pictures. Yet a serious philatelist who perhaps specializes in Postmarks, Postal History, Boer War or any other specific topic is essentially interested in a certain topic aka ‘Thematic’. Should we look at the subject in that light then virtually every collector is essentially a collector of a certain ‘Theme’. This is said to be ‘birds on stamps’. 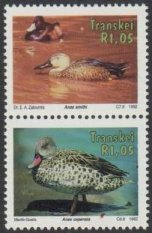 The collectors of Southern Africa ought to have a field day with this particular theme as the Southern continent abounds with bird life...there is however a slight problem...the Union of South Africa during fifty one years of stamp production did not issue a single stamp which depicts a bird! In neighbouring South West Africa they at least came up with one value being the 1931 ½d definitive depicting a Kori Bustard. Between 1931 and 1952 the same stamp is overprinted with three types of ‘OFFICIAL/OFFISIEEL’. Angola 1951 definitive issue of 24 values, a popular and sought after set that eclipsed any other bird theme for Southern Africa. Ten years later RSA, SWA and Bechuanaland finally depicted some birds on their stamps. Angola’s next set of birds appeared more than 30 years later in 1984. First Republic definitive includes three values with birds ½c African Pygmy Kingfisher, 3c Crimson-breasted Shrike and 20c Secretary bird. What theme ought to take second and third place? This pictorial definitive includes eight low values from 1c to 12½c depicting birds. 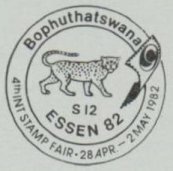 When the country became a Republic, the same stamps were overprinted ‘REPUBLIC OF BOTSWANA, and issued on 30 September 1966 and their first ‘proper’ definitives of 14 values followed on 3 January 1967 all depicting birds. 1c African golden oriole, 12½c Brown-hooded kingfisher. 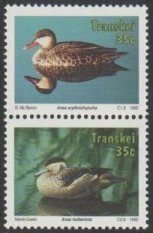 Botswana certainly took advantage of the ‘bird theme’ and used it on subsequent definitive issues in 1978, 1982, 1997 and 2014. Several commemorative issues (stamps and/or miniature sheets) also included images of birds. In due course this Presentation on Southern Africa Birds will be expanded. In early November I started to systematically build up a picture show of the Homelands on this website and there are currently six pages reflecting a host of material. However it is not as yet complete as scanning, cropping and resizing images is a time consuming task. Pictures are all very well, but in my opinion it ought to be accompanied with some dialogue. Effectively a series of articles is required for each Territory and the subject matter needs to aim at being of interest and hopefully ‘entertain’ the reader which ought to encourage them to read subsequent articles. (1980, 1983 and 1986) which relate to TBVC. The Springbok (1980) Issue No 164 page 38, Venda (one page) a map copied from the Venda Brochure published by INTERSAPA (1979) plus a few paragraphs, also copied from said brochure. (28 August 1981) by W.A. Page, a description of the designs, the information is copied from the FDC inset...not really ‘an article’! A note by Reg Allen informing the reader that information received from the SA Government Printings include RSA, SWA and Homelands. He does not wish to publish the info for SWA and TBVC in The Springbok and passes that onto Tony Chilton and Alec Page. The above represents the sum total of forty years worth of Springbok Issues. 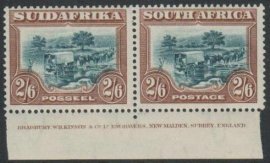 I suspect that the lack of articles is not necessarily related to a lack of interest as any Philatelic Researcher and Writer ought to be able to generate something of interest that will divert the attention of a South Africa collector from his study of flyspeck varieties on the ½d Springbok and 1d Ship! Does Anyone Write About the Homelands? There is a small group of TBVC enthusiasts in South Africa. Instigated in 2009 by the late Rev Cassie Carstens, a small group of people meet in Pretoria once a month. 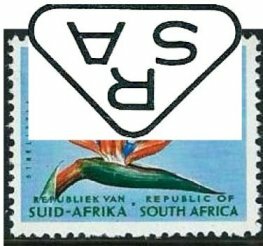 A boxed advetisement in the back of The South African Philatelist invites the reader to join their group and to contact, either the Chairperson Jan de Jong or the secretary Eugene du Plooy. All very well, I sent an email to Eugene, only to find that his email address is no longer current. I made contact with Jan de Jong, but what their exact object is seems a bit vague. 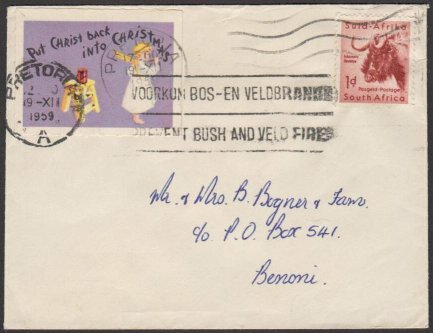 On the one hand, whatever they are writing is only available to a handful of individuals and that is not going to generate a general interest in TBVC Philately. Another member of the above group is Heinz Wirz who informed me that he is writing a ‘book’ on each of the TBVC territories. What is confusing is that the review refers to each ‘book’ as a ‘catalogue’. In early December, courtesy of Ian Frith, I gained sight of both ‘books’. Beautifully illustrated, but not a great deal of dialogue...at best I can describe them as extremely complicated ‘catalogues’ that would confuse the majority and is probably only understood by the author. Even the pagnation is confusion as each coded section is numbered seperately...thus the SAP Ciskei review states there are 299 pages and my count is 380! 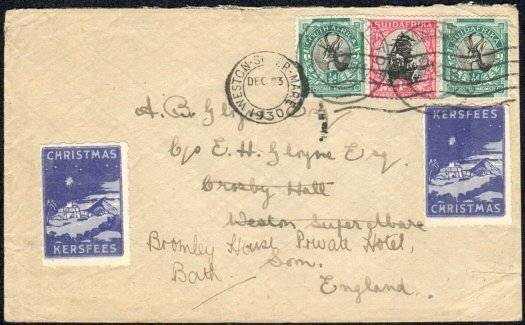 Another pitfall of Philatelic publishing is when a collector attempts to ‘price’ the items. Heinz introduced a complicated system of 16 ‘colour coded’ prices ranging from R5 to ‘over R1000’ Thus for ‘common’ material the range is R5, R10, R15, R20, R25, R35, R50, R75, R100. Converted to GBP it is effectively in 25 pence steps up to £5. The Universal yardstick for cheap and/or common material is EBay. Basically the minimum price for any junk is £1 and usually on top of that there is a minimum P+P charge of £1. It takes the colour code system six steps to reach the £2 mark...my advice on pricing is to leave it to the Stamp Trade. 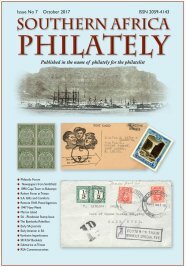 Having published my own Philatelic journal since mid-1993, it has gradually escalated to being the editor of three journals and I currently write around 200+ pages per year. My aim is often to choose a subject and/or aspect that very few people have ever considered...by doing something ‘different’...it hopefully finds an audience...to this end I have written three four page articles on the Homelands in the past few weeks. The first is a review of the allocated cylinder numbers used for the Transkei stamp issues supported by a host of colourful illustrations. The foregoing will appear in the January 2018 issue of The Springbok and these four pages exceed the sum total on Homelands in the journal for the past forty years! 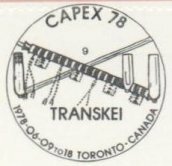 As I pointed out in my previous ‘post’ on 20 December, very few people pay attention to the designers and that has now cumulated into two four page articles on the Artists/Designers of Transkei and Bophuthatswana stamps. 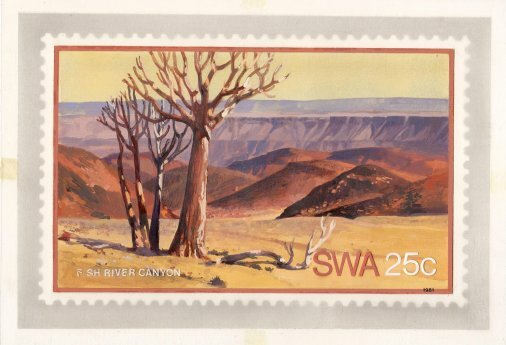 A subject like this tends to have a knock-on effect as the same artists that did work for the South African Post Office also designed stamps for RSA, SWA and then for Namibia. Thus there are other potential articles on the stamp designers for RSA & SWA. 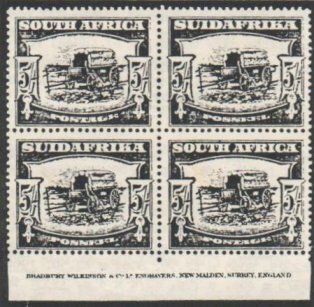 For almost twenty years the Government Printer and INTERSAPA were onboard a ‘gravy train’, producing stamp issues for South Africa, SWA, Transkei, Bophuthatswana, Venda and Ciskei. Perhaps the 21st Century Philatelists do not have an interest in the above and prefer to collect ‘other things’ but they can at least take the time to read articles on the ‘modern matreial’ that will come on offer SOON! Although the Stanley Gibbons Catalogues include the names of the designers/artists (when available) I doubt that many collectors take notice of this information. Not merely their names, but who they are and whether or not they are ‘all round’ artists or specialists in a particular field. I have a number of hand painted essays of SWA (1980 - 88) that are posted on this website and I present a brief resume of the various SWA artists. Recently I gained access to the artwork of the stamps of the Ciskei and noted the names of the artists. This exercise snowballed and I expanded it to include all the Territories. I now have a general overview of the people involved and the next step is to write up the various personalities which will be a lenghty task. A new policy was introduced by the Government Printer in Pretoria on the March 1972 Opening of the Verwoerd Dam set. It includes the name of the artist in the margin below the design. At a later date their names were sometimes included in the actual design. If space was at a premium only their initials appeared. In general the name appeared on each design, but another variation is to only include it on one stamp of a commemorative issue of perhaps 3/4 stamps. In general each set was generated by one person, although several sets were designed by more than one artist. A few examples are: 1972 Wool definitives 4c Kobus Esterhuysen and 25c by Heinrich Botha. 1973 ESCOM 4c Johan Hoekstra, 5c and 15c Michael Barratt. 1973 UNISA 4c & 5c by Hannes Meiring and 15c Pierre de Wet. Set of eight is designed by three artists e.g. In certain instances the designs are taken from photographs, thus there is no need to attribute it to any particular individual. Promoting Southern Africa Philately started after I constructed two websites for Philatelic Societies. Many similar sites may have a reasonable amount of interesting information, but are often dormant and gradually stagnate. Once my sites were in place, I thought what do I do next? The obvious answer being to add items of interest such as a picture show of artwork, stamps, covers, labels etc. By inserting key words into Google I soon became aware what was not on the internet. If there is nothing of interest the above is all that is present and that hardly promotes the philately of any particular area. Images alone are not sufficient and added dialogue makes ones picture show ‘more interesting’. Many serious collectors show no interest in modern stamps. As a result they have little or no knowledge of the foregoing. I am perhaps more fortunate in as much that as a professional dealer I may have handled some of the moderns. 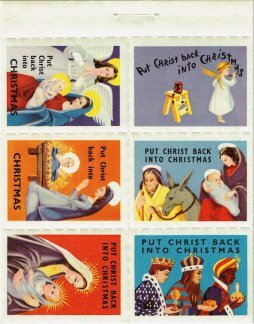 In order to post images on the internet, I require jpeg scans and the most practical method is to buy the stamps...easier said than done. Attempting to acquire a complete run of modern stamps from inception to date is a challenge. 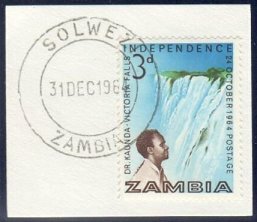 It took a year to complete Botswana, almost as long for RSA Commemoratives. In November 2017 I acquired a collection of South African Homelands, said to be complete, but it is not. Finding the missing items is difficult...EBay fills a few gaps...several collectors promise to provide what is missing, but they do not send any scans and eventually I give up. Launched in September 2015, its aim is to provide articles on all aspects. It complements the efforts made on the internet and once I complete the web pages, the data gathered, provides the inspiration for several write-ups on an array of themes. After I completed Botswana I reviewed fifty years of stamp production which was published in Gibbons Stamp Monthly and also in The Runner Post. 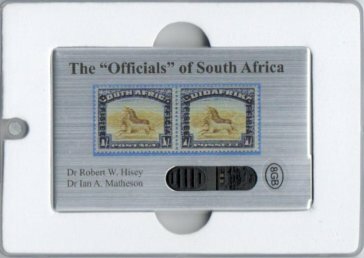 Republic of South Africa Commemoratives led to reviews of the stamps plus an article on major RSA varieties. 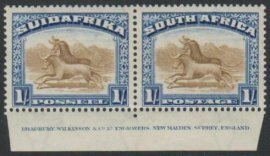 The foregoing provides more material for the websites or future articles in journals such as The Springbok, The Rhodesian Philatelist, Southern Africa Philately and/or The Runner Post. 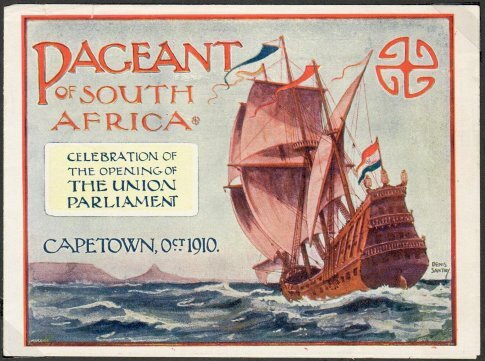 Examples are the 1910 Cape Town Pageant, South African WWII labels, Victoria Falls, SWA Hand Painted essays. 16 December 2017. It is more condensed and the Maxi cards feature with each relevant issue. This project is ongoing, I am not bogged down with a few limited interests. For some thirty years I concentrated my writing on all aspects of Rhodesia from the 19th Century to arround 1990. 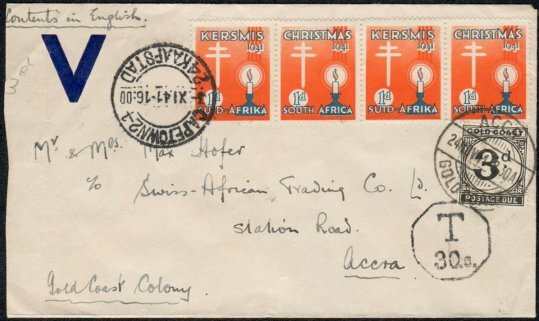 I have always had an interest in other related South and Central African Philately. I spent many years collating information on the major South African Varieties. 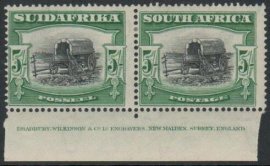 Besides an array of articles the previous groundwork was extremely helpful in assembling a page on South Africa the Ten Rarest Stamps. SWA and Basutoland are not yet complete. When time permits I revamp previous pages. Nambia is waiting on the sideline. No doubt 2018 ought to be just as rewarding as 2017 has been! Additions etc is posted at the foot of this page. I have emailed the Authors and hope to glean further information from them. 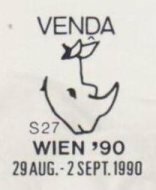 In the November 2017 Edition of The Springbok No 340 the following is published...Does it exist - A R1 Inverted Watermark? The R1 Sterlizia (Redrawn) watermark RSA from cylinders G11 4 6 is listed by Stanley Gibbons as SG A251w and also by the South African Colour Catalogue as SACC 243a. In both instances unpriced, I have never seen an example and neither has Mike Tonking. Question is does it exist? An opinion ventured suggests that someone may have mistaken a R1 with a Tete-Beche watermark as having an inverted watermark. Stanley Gibbons Catalogue Editor, Hugh Jefferies has promised to look into the matter in due course. Roy Ross, the Editor of the SACS journal The Springbok submitted the following interesting and very useful observation regarding the alleged existence of this listed variety. This at first glance looks like the inverted watermark that Otto mentioned in the last Springbok. The watermark shown is from the front of the stamp and the right image is its position on the stamp. I have tried unsuccessfully to take a picture from the watermark machine. Research confirms that it is not the stamp mentioned. 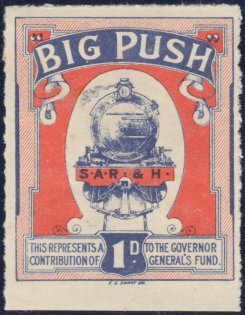 The supposed cylinders that this stamp is from, G11 4 6 has a matt finish and a white/blue back, Harrison paper, when viewed under an ultraviolet lamp. This stamp has a semi matt finish and a dark back under the ultraviolet lamp. This confirms that it is Swiss paper and as it the only issue that does not have a fluorescent front and back it must come from cylinders 259 258 257, which has a tête-bêche watermark. Without the aid of an ultraviolet lamp this could easily be mistaken for an inverted watermark as in all other appearances it does look like it comes from cylinders G11 4 6 with a single RSA watermark but as stated it is in actual fact a tête-bêche watermark. The rest of the watermark is not visible. The Errol van Greunen document (354 pages) is in the process of being split into more manageable sections. South African National Stamp Exhibitions is seperate and currently 126 pages. Overseas International Stamp Exhibitions is now 33 pages. In time I will reformate Errol’s work which ought to more than halve the number of pages. Searching though some boxes of jumble I came across a folded With Compliments card used by Eric. It looks like it was used as a stiffener and on the reverse there are a few columns headed ‘Wants List’. I thought I ought to share this with our viewers. This is the first time I have seen this elborate design. Given that the late Edward Lauder was resposible for the original Springbok design for the front cover of the Society journal. I wonder if this was his work as well. 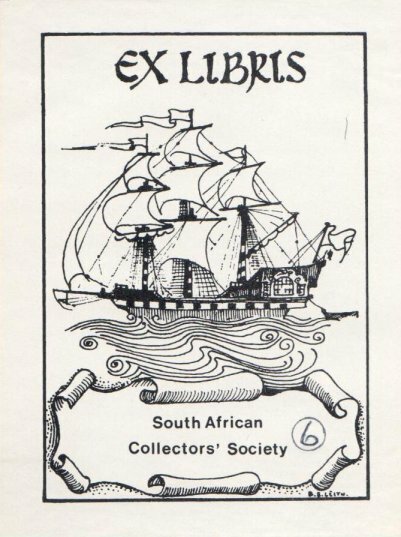 Today the South African Collectors’ Society enjoys an extensive Library, kept in order and managed by Malcolm Ridsdale. In The Springbok Issue No 1 in February 1953 said Library had a humble beginning as published on page 21 of that journal. 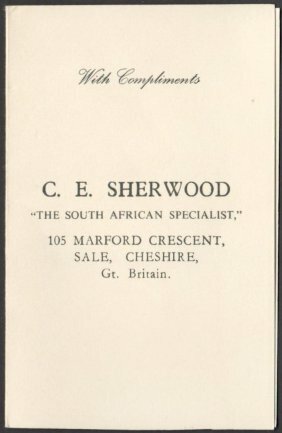 One of the original intentions when the Society was formed was to get together a library of books, catalogues, etc., all relevant to the Union of South Africa Philately. So far the following have been acquired and are available for free loan to members on receipt of postage. 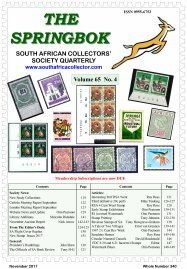 The South African Philatelist is now nearly five years old and it has never missed an Issue. It is the only British Colonial journal which regularly illustrates new issues and varieties of interest to its readers. 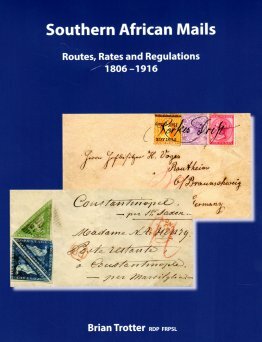 It is splendidly produced, being streets ahead of all other British Colonial philatelic journals in the matter of production and quality of contents. The Springbok (November 2017) went to the printer recently, a PDF copy has been distributed and hard copies will be posted in December. The Springbok 2017 Index - Posted on the relevant page on 29 Nov 2017. RSA varieties - Previously unrecorded modern varieties have been brought to my attention by Ian Frith...some have already been added to the listing...more to follow. A successful and enjoyable weekend with over forty people attending. Overseas enthusiasts included Peter Thy (Denmark/USA) Lars Jørgensen from Belgium entertained us with Transvaal, Alan MacGregor from Simon’s Town in South Africa participated in a joint display of Bechuanaland on the Saturday afternoon. Eddie Bridges & Carol Bomarito came over from New York and hope to make it for the June 2018 Philatelic weekend. Many of our regulars attended and I was delighted to see Robert Johnson in good form. Bob Hill entertained the audience on Sunday by carefully demonstrating that Kit-Kat and Southern Africa Philately have much in common. Lars Jorgensen won the cup (again) for the best Saturday display. Unfortunately Paul van Zeyl from South Africa couldn’t make it on this occasion, we all missed his ‘alternative English’...Wat sê jy Boetie? Chris Rainey and David Morrison brought a good selection of Postal History and Mike Deverell is once more back in the UK and also attended. Friday and Saturday dinner was served in our Conference room and John Shaw delivered his traditional After Dinner Joke. As always there is not enough time to do all the things one planned beforehand...I was actively collecting 2018 subscriptions for the Southern Africa Philately journal. 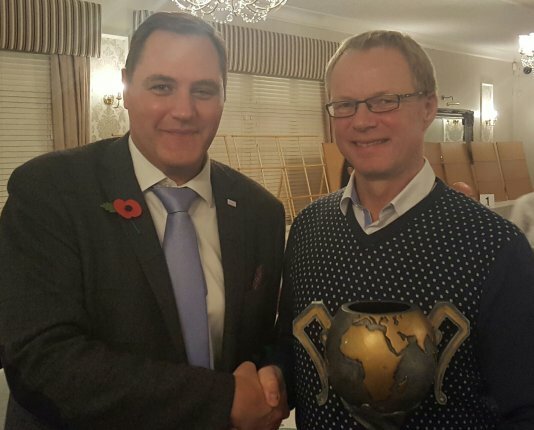 The above venture is not intended for profit, it has shown a modest surplus and Southern Africa Philately donated £250 towards the cost of the 2017 Annual Southern Africa Philatelic Conference. This long awaited ‘book’ does not come as a printed version but as a ‘credit card flash drive’. 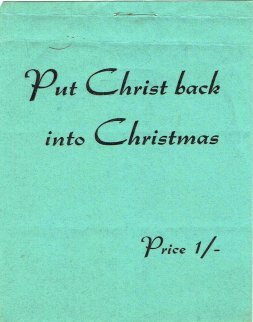 Being somewhat old fashioned I had no idea what I might receive. Could I use it in a restaurant and buy my wife dinner e.g. ‘credit card’. Once I got hold of a copy I pondered which slot in my computer might accommodate said device and lo & behold it is merely a sophisticated memory stick. I anticipated chapter and verse on all aspects of the Officials and had avoided writing any more articles on the subject in case I might be accused of reinventing the wheel! We may all rest assured that is not the case, I gain the impression that it is more or less a clinical listing of the issues and dialogue is minimal. Being a Professional Philatelist and Researcher I targeted the ‘difficult’ areas of the Officials to see if I could learn something new and must admit I am disappointed. For instance the authors do not inform us on which set of cylinders SG 035 is printed, nor do they take into account the distinct difference in shade between SG 035 and the first overprint on the 1950 2d SG 045. The inverted overprint SG 045a allegedly comes from ‘one sheet only’, says who? I ought to know as I discovered said variety and all I could go on was that I had a pair. One must commend the authors for their efforts, but I did expect a bit more ‘meat on the bones’...perhaps a ‘philatelic diet’ is a recommendation. The plus of the ‘credit card flash drive’ is a PDF version of the 1986 UHB, but then I have also been critical of that publication. The above took several hundred hours to achieve, so treat yourself and take a look please! A new page added covering all commemoratives from 2011 to the end of 2016, I started this mammoth task a year ago and at last it is complete.